It was the start of 8th grade. Having only known life as an Air Force brat, this was my eighth different school since kindergarten. But this year was different. I had just come from a school with twenty students in my grade, and my new school had over 220. My teachers and classes went well, but then came that dreadful lunch hour. Although I had changed schools before and had to make new friends, this was my first vivid memory of feeling alone. Being alone isn’t necessarily a negative thing. Solitude is good and needful at times, and usually because you want to be alone. Feeling alone is more of an emotional state or reaction. I felt isolated. I remember wondering what I would do during lunch hour, where would I sit and eat, where would I stand outside afterwards until the bell rang to go to my next class. Whether that feeling lasted two days, two weeks or two months, I am not sure, but I know I didn’t stay alone. One girl befriended me. She was not new to the school, but she must have seen or sensed I felt alone and she reached out to me. Another girl I met was new that year, too. I didn’t know there was someone else like me who felt like I did. Although the school I had just left was 10 miles away, she had moved all the way from Alaska to Oklahoma! This happened over 30 years ago, and I honestly can’t remember whether she found me or I found her, but I know God brought us together. Multiply that isolating feeling from 8th grade lunch hour many times over, and you can only imagine how alone I felt at times when we found ourselves facing years of infertility. Or you might know exactly how I felt if you are there right now facing it yourself. The trials we endure throughout life or compared to others are different, but we can apply what we have learned in other circumstances to help navigate through a different set of circumstances. Just like the girl, who was not new, befriended me at school, I can tell you of many women who befriended me in my infertility. Women who had also experienced infertility found out I was going through the same thing, and they reached out to me through notes and hugs, listening and tears, and most of all, prayers. Even women who didn’t know exactly what it was like to experience infertility still showed compassion by seeking me out to encourage me and fill me with hope. I felt alone at times, but because of them, I didn’t stay there. During that 8th grade lunch hour, I may have looked around for someone who was quiet like me and eating alone, or perhaps she was the one who looked up and noticed me standing around the courtyard by myself, looking lost. You may think you are the only one on this journey of infertility, but if you and I took the time to look at others around us, we just might find a friend on the same infertility road. We look at the woman with the college degree who works full-time and automatically assume she must be putting her family on hold to climb the corporate ladder. We don’t see she just might be trying to get pregnant and longing for the day when she can have a baby and be a stay-at-home mom. We look at a young wife and form an opinion that she is so newly married that we don’t even realize she’s had several miscarriages already and is quietly grieving. We look at a happy couple that loves dogs and decide they must be animal-lovers and not really want kids of their own. We don’t even consider that they could be privately enduring heartache after heartache of infertility. Two different circumstances, the same feelings of isolation – they are both normal experiences that other people are going through, but we don’t have to stay alone. We can accept the support when others reach out and not feel isolated anymore, and we can stop the seclusion and look for someone who could be experiencing similar pain and try to encourage each other. I understand that however long your journey of infertility is, you will still feel alone at times and that no one seems to care. We are never alone because we have Jesus. Whether you know Him as your Lord and Savior or not, He knows exactly what you’re going through. He will hear when you cry out to Him. There is no need to hide the pain, the fear, the tears, the questions. He already knows, and He cares. This verse from the song, “Untitled Hymn – Come To Jesus” by Chris Rice makes me cry and smile at the same time. Sometimes the way is lonely and steep and filled with pain. So if your sky is dark and pours the rain, then cry to Jesus. Cry to Jesus. Cry to Jesus and live. In friendships, or the lack thereof, you can feel alone. The girl who reached out to me that 8th grade lunch hour became my friend and although we have not remained close, I still remember her reaching out to me. It brings a smile to my face, and I will always be grateful for her. The girl from Alaska became my best friend that year and I still consider her one of my best friends and am thankful she loves me in spite of my failures and flaws. If I ever have feelings of being alone in this area, and once in awhile, those feelings crop up, I look at this little album I made called the A to Zs of Friendship and am reassured of the special friends God has given me throughout my life, from those who have accepted me as I am to those who have zipped to my rescue. I am not alone! In infertility, you can truly feel alone. But with the concerted efforts of Resolve to bring awareness, you can see you are not alone. I can look at my facebook profile and count 37 friends who have experienced infertility and loss and those are the women I know about. That’s over 12% of my facebook friends. I am not alone. You are not alone. Psalm 10:17 God will always hear our prayers. 2) May we not hope that he who has been will still be, will ever be, a God hearing prayers? But observe, (1.) In what method God hears prayer. He first prepares the heart of his people and then gives them an answer of peace; nor may we expect his gracious answer, but in this way; so that God’s working upon us is the best earnest of his working for us. He prepares the heart for prayer by kindling holy desires, and strengthening our most holy faith, fixing the thoughts and prayers, raising the affections, and then he graciously accepts the prayer; he prepares the heart for the mercy itself that is wanting and prayed for, makes us fit to receive it and use it well, and then gives it in to us. The preparation of the heart is from the Lord, and we must seek unto him for it (Proverbs 16:1) and take that as a leading favour. Don’t Give Up On Your Miracle Baby – Resolve to have audacious faith in 2014. As an optimist, I always look forward to a new year. Some of my goals and resolutions may be the same year in and year out, but I welcome the fresh start. A new year is a reminder I can try again. I don’t have to give up on what I left undone or didn’t quite reach the year before. This new year, 2014, don’t give up on your miracle baby or babies. My son is now 7 and yesterday, I came across some notes I had written the day we announced in church that I was pregnant. I wish I had had a video cam that day, but I kept track of as many well wishes and congratulatory remarks as I could remember, and it is a precious memory that brought tears to my eyes and a smile to my face. Year after year before that January 8, 2006 announcement, I faced times of discouragement, heartache, and confusion. I wondered how I would ever become a mommy. I always experienced regular cycles. To put it plainly, once married, I had approximately 150 monthly periods in a row before I became pregnant. After each setback or disappointment, my husband would say, “I still think you will get pregnant.” Those words of faith encouraged me to keep pursuing my miracle baby. Psalm 113:9 and many other Scriptures encouraged me to continue believing. Although it’s not as simple as putting “have a baby in 2014” at the top of your list of resolutions, I encourage you not to give up on your miracle of having a baby. Don’t give up on faith. In fact, resolve to have audacious faith – faith that is confident and bold. I don’t know what the Lord will do in your life, with your experience of infertility or loss, but I know what He did in my life, and I have seen time after time with friends and acquaintances how He has performed miracles with details unique to each couple that no one could have imagined. Don’t give up faith. We just don’t know how or when God will answer. I would like to wish away the tears that come unexpectedly, without warning, seemingly without reason. Yes, I cry for the baby girl – we – my husband, my son, and I want to add to our family but aren’t really pursuing. But is that all my tears represent, after all this time? I remember the tears, just like the tears someone is crying today. I cry for the woman who is viewing her ultrasound for fibroids, cysts, or endometriosis – instead of viewing an ultrasound of a growing embryo in her uterus. I cry for the woman alone in the waiting room of her OB-GYN waiting for her next pap smear – instead of waiting to hear the measurements and heartbeat of her growing baby. I cry for the woman who miscarried after IVF – instead of hearing the hCG levels after IVF were rising beautifully in the right direction. I cry because I have been there. But then I pray for them. I pray for joy for them, too. Post gaudia luctus. That’s Latin for “joy succeeds sorrow.” Several verses in Scripture confirm this. Matthew Henry’s Commentary on this verse: Those are comforted indeed whom God comforts, and may forget their troubles when he makes them to rejoice from their sorrow, not only rejoice after it, but rejoice from it their joy shall borrow luster from their sorrow, which shall serve as a foil to it; and the more they think of their troubles, the more they rejoice in their deliverance. Matthew Henry’s Commentary: Suffering saints are in tears often; they share in the calamities of human life and commonly have a greater share in them than others. But they sow in tears; they do the duty of an afflicted state and so answer the intentions of the providences they are under. They shall have a harvest of joy. The troubles of the saints will not last always, but when they have done their work, shall have a happy period. Psalm 30:5b “Weeping may endure for a night, but joy cometh in the morning. Matthew Henry’s Commentary: If weeping endureth for a night, and it be a wearisome night, yet as sure as the light of the morning returns after the darkness of the night, so sure will joy and comfort return in a short time, in due time, to the people of God. Join the Movement. Apply the Ointment. I am trying to make a difference in the lives of people with infertility. I know how it feels. I know how it hurts. I have one son, yet infertility is still with me. I can’t take away my infertility nor can I take away your infertility. But I can apply the ointment to help alleviate the pain of infertility. In one word, the ointment is Jesus. Assuage – I like that word even though I don’t use it in my everyday vocabulary! It means to lessen the intensity of something that pains or distresses. Through prayer, His Word, a caring friend, a compassionate family member, a song, a devotion, a sermon, and a blog, Jesus applies the ointment to assuage your pain of infertility. He soothes your troubled soul, calms your anxious heart, comforts your disappointed spirit, and quiets your fears. 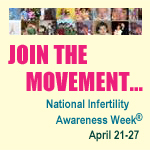 National Infertility Awareness Week isn’t just a week to make others (who seem unaware of infertility) aware of infertility. This week causes me to reflect on where I have been and praise God for what He has done in my life through this trial of infertility. In a sense, this week I relive the pain to relieve the pain for others who are hurting. This year, I purpose to apply the salve to the women I personally know who are experiencing infertility by praying for them and encouraging them more consistently. The word ointment comes from the Latin word unguere, meaning to anoint. When Jesus applies the ointment to our hurting hearts, He is choosing or consecrating us to do the same for others who are hurting. I do hope for you the joy a baby can bring. I also pray that you will receive the ointment that can bring you joy as you journey through infertility. On January 15,2010, I started my blog, due in part to the following devotion I had read four days earlier on January 11 from Streams in the Desert. I had written in my Streams journal on that day in 2002, realizing I did need training to be a comforter and there would be others down the road that I could help just as someone helped me. Store up comfort. This was the prophet’s mission. The world is full of comfortless hearts, and ere thou are sufficient for this lofty ministry, thou must be trained. And thy training is costly in the extreme; for, to render it perfect, thou too must pass through the same afflictions as are wringing countless hearts of tears and blood. Thus thy own life becomes the hospital ward where thou art taught the divine art of comfort. Thou art wounded, that in the binding up of thy wounds by the Great Physician, thou mayest learn how to render first aid to the wounded everywhere. Dost thou wonder why thou art passing through some special sorrow? Wait till ten years are passed, and thou wilt find many others afflicted as thou art. Thou wilt tell them how thou hast suffered and hast been comforted; then as the tale is unfolded, and the anodynes applied which once thy God wrapped around thee, in the eager look and the gleam of hope that shall chase the shadow of despair across the soul, thou shalt know why thou wast afflicted, and bless God for the discipline that stored thy life with such a fund of experience and helpfulness. Selected. This great truth is universally used to encourage one another, whether it’s for our own reminder or to give another hope. But if I asked you to quote its reference or share its context, would you be able to tell me? Having just celebrated Christmas, the season of Christ’s birth, I recently read the account in the Gospel of Luke. Not only did the angel Gabriel tell it to Mary, in Luke 1:37, to assure Mary that she would conceive a son in her womb by the power of the Holy Ghost and call him Jesus, but he also encouraged her faith by saying that her cousin Elisabeth, who was stricken in years and had been barren, was now with child. That is why I continue to blog. I have experienced the performance of God’s promise, and I want to encourage you – don’t give up hope! May God bless you and the fruit of your womb in 2013. What is a wounded soul but one aching for hope? You wield the power to heal the hurting. You hold the words to affirm the doubting. Several years ago, my husband recommended I listen to a series about encouragement on Dr. David Jeremiah’s radio broadcast. 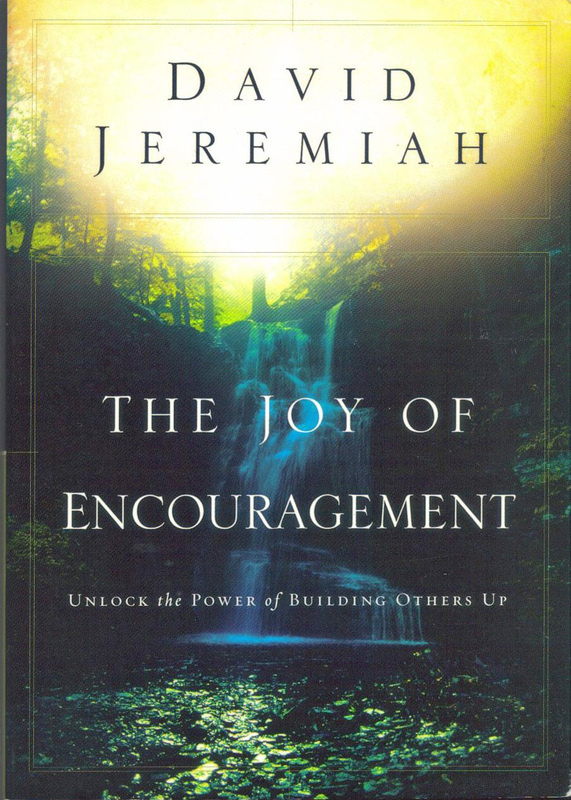 It was such a blessing to me, that I promptly ordered his book, The Joy Of Encouragement. Since I recently shared some thoughts on becoming a self- encourager, I want to recommend my main source – this book and its study guide. Dr. Jeremiah will share how to encourage and how not to encourage anyone you know – your husband, your children, your friends, your fellow church members, and a world that needs to know about the love of Jesus. You may request a copy of the book by giving a donation in any amount by clicking on this link: The Joy Of Encouragement by David Jeremiah. You can also order a study guide through Amazon.com or other places online. Be sure to find out whether you are ordering the actual book or study guide. I ordered a book on Amazon thinking I would give it to a friend, but instead it was the study guide, so I kept it for myself! I recommend this book to anyone who is hurting or to anyone who wants to learn how better to encourage someone who is going through a difficult time. The Joy of Encouragement is an uplift in itself. You’ll find yourself basking in God’s love while giving it away.